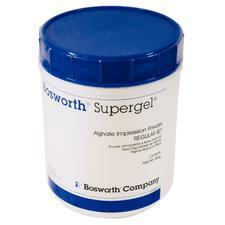 Supergel and Tray Aways work together to produce predictable, detailed final impressions. The trays were made with good quality rigid plastic, fit well, and are easy to adjust and modify after warming up with a flame. Supergel is easy to use with superior detail capturing. [These products] enabled us to work easier, quicker and more accurately. When choosing an alginate impression material, dental professionals look for a material that easily mixes to a smooth consistency, has a rapid setting time, and resists tearing. When selecting impression trays, size options and rigidity are important features, and, of course, the ultimate goal is an accurate final impression. 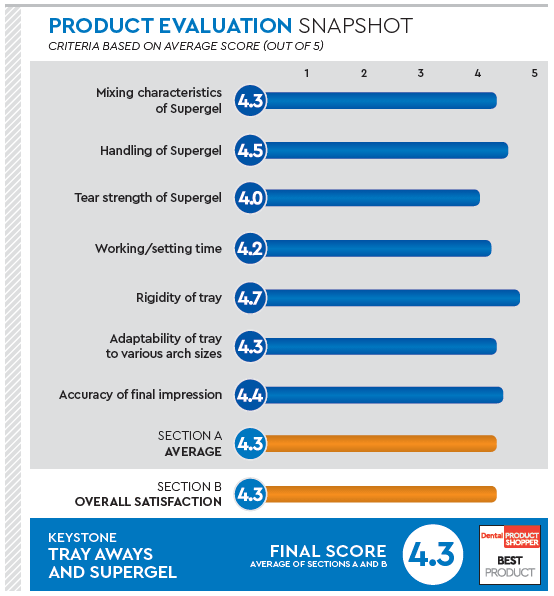 Keystone’s Supergel alginate impression material works together with Tray Aways impression trays to produce accurate impressions while maximizing patient comfort. For Dr. Karyn Halpern, Supergel was easy to mix to a smooth consistency, allowing her to “produce a predictable clean impression free from drags and tears.” Overall, our team of evaluators decided that the combination of Supergel and Tray Aways results in a detailed final impression and highly satisfied patients. A blended alginate impression material that mixes to a smooth consistency, Supergel produces consistent, accurate, bubble-free detailed reproductions, according to Keystone. Noting that it mixed with water to an even and thick consistency, Dr. Andrew Fundo said the dental alginate stayed in the tray without running over the edges or slumping. Dr. Sean Grady said the material was dimensionally stable and his assistants were able to mix the material with consistency, which resulted in better, consistent impressions. Dr. Winter thought it was a little harder to mix than his usual material, and Dr. Bruce Weitz recommended finer particles for the powder. “I really like the consistency and smoothness of material and very little dust,” shared Dr. Mitchell Pasenkoff. Made from rigid, high-impact styrene, Tray Aways disposable impression trays have smooth rounded edges, interior retention slots, and vertical perforation to help create a consistent, dimensionally- stable impression that’s free of distortion or bite through. The perforated trays come in 3 sizes for the upper and lower arches and are also available for partials and anterior impressions. “The trays were made with good quality rigid plastic, fit well, and are easy to adjust and modify after warming up with a flame,” shared Dr. Fundo. Dr. Dale Schuur commented, “The trays are sized well and are stiff with plenty of retention holes.” A couple dentists had trouble fitting the trays in the mouths of children, and one said he would like more flexibility. Praising the trays for their smooth finish and retentive properties, Dr. Weitz said he could eliminate a step in the impression-taking process because he didn’t have to apply an adhesive to the tray.